A climate map is a graphical representation of the distribution of the prevailing weather patterns in a given area that has been observed over a long period. The climate of a region can be defined as a dominant weather pattern recurring in one area over a long period of time. It is measured by assessing variables such as humidity, precipitation, temperature, atmospheric pressure, and wind. Climate is different from weather in that weather is a measure of the above variables over a short period of time. Regions around the globe are divided into climate zones, sometimes known as the Koppen climate classification. The various zones can be represented on a sheet of paper or flat surface by a climate map. A map is a graphic representation of a feature on the earth’s surface. There are several types of maps including thematic maps, topographic maps, road maps, and climate maps among other maps. A climate map is a graphical representation of the distribution of the prevailing weather patterns in a given area that has been observed over a long period. The map can represent an individual climatic variable or a combination of all the variable. A climate map provides an overview of the climatic features over a large region and allows for the comparison of the climatic features in different regions. It can represent the climate of a country, region, continent, or the entire globe. The maps also help scientists track and illustrate climate change in different regions. The information presented on a climate map often applies to individual months or averages over the entire year. The map represents information that has been gathered over a period that can stretch over decades. The various climate classification systems can be used to produce a world climate map. Specific seasons can also be illustrated on the map. There are two main types of climate maps: temperature maps and precipitation maps. Temperature maps represent the average monthly temperature of a particular area over a period of time while precipitation map show distribution of precipitation variable such as rainfall and snowfall in a given area. Apart from indicating the climatic pattern of an area, climate maps are also be used to predict the future effects of climate change and possible effect of global warming. 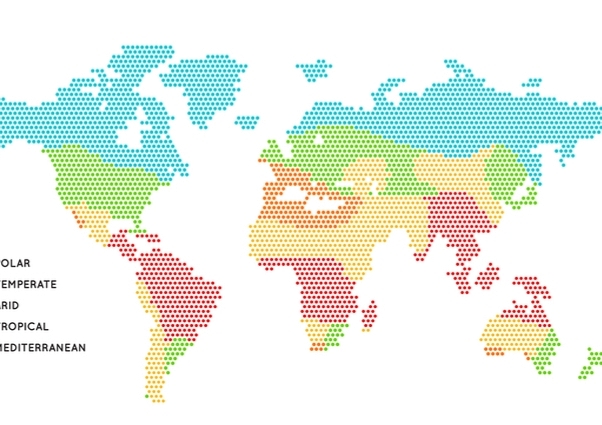 Climate maps are overlaid with colors representing the different climatic zones. There are no standard or specific color for each climate zone as long as different colors are used to differentiate climate zones within the same area. In addition to colors, letter codes are also used to specify differences among zones. Isolines are drawn on the maps to connect points with equal long term mean values of a climatic variable (temperature, atmospheric pressure, and humidity). Isobars are used for pressure, isohyets for precipitation, and isotherm for temperature.